This week, Android takes over yet another major TV brand as Sharp becomes the third manufacturer to build the Android TV operating system into its smart TVs. The operating system brings with it some 1.4 million apps and game from the Google Play app store, along with the potential to interact with and control them from both Android and Apple smartphones. Sony and Philips also use Android in its smart TVs. Just now reaching retailers are nine new Sharp Aquos UHD TVs, divided among the company’s good (UB) / better (UE) / best (UH) series and ranging from 43 to 80 inches and $800 to $6,300. The five Aquos models comprising the better UE and UH lines include the Android TV platform and a slimmed-down version of Sharp's own Smart Central smart TV operating system, while the four entry-level UB models employ the full version of Sharp Central. Although the Android TV website currently lists only 39 smart-optimized Android TV apps (with HBO Now still pending), Sharp representatives told us Google engineers are optimizing 500 to 700 apps a week to work on larger UHD displays. 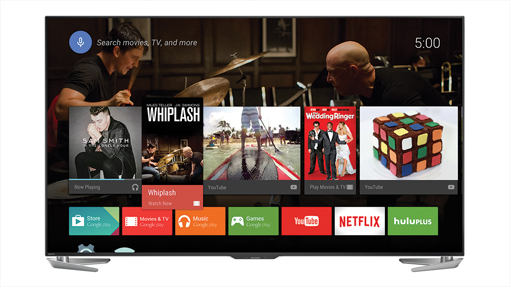 Each Sharp Aquos UHD will come preloaded with Android TV apps, including Netflix. You'll be able to acquire more apps through the Google Play store directly on the TV. Representatives weren't clear when these hundreds of apps would begin to be available. When Sharp says its Aquos UHDs are smart, it’s not kidding. 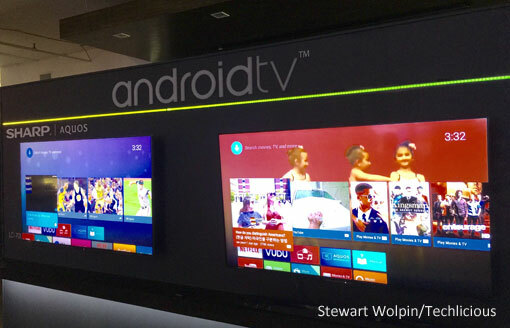 The row of top apps will change as Android TV learns your viewing habits, reps say. The top-line Aquos UH series models come with a remote control that includes a touchscreen and voice search. While spoken search results popped up nearly instantly during our demonstration, they included only Google Play and some Sling-based results, not the universal searches supplied by media streamers such as Roku and Amazon TV. The remote can be purchased for UE models at a sub-$100 price yet to be announced. You can also control these Android TVs via the Google Cast app on Android smartphones and the Chromecast iOS app for iPhones. Content from compatible smartphones can be transferred to a mirrored app on the UHDs. TVs in Sharp's top two Aquos UH lines employ two primary picture-enhancing technologies. Spectros is a filter that widens and brightens the set's color spectrum by 21 percent over Sharp's other UHD models. AquoDimming, which Sharp introduced last year, supposedly uses software to control individual pixels to enhance sharpness and contrast to reveal details in dark scenes. Given the physics of LCD technology and LED backlighting, tech reporters including this writer remain dubious about AquoDimming’s capabilities. Only OLED TVs are able to have pixels individually controlled. But AquoDimming did seem to increase both sharpness and contrast during our demonstration. UH models also include AquoMotion 960, designed to reduce blur in fast-moving scenes caused by the LCD's naturally slow refresh rate. These and other technologies have led THX to give these Aquos UH UHDs THX certification. The three UE models lack the Spectros filter technology but include AquoDimming and the AquoMotion 480 blur reduction. The three smaller UB models include AquoMotion 120, and the 65-inch model uses AquoMotion 240 and full-array local dimming backlighting.